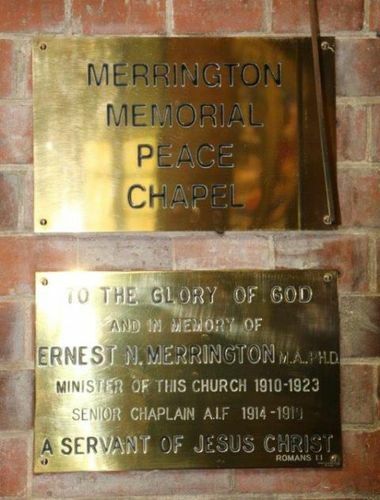 The Merrington Memorial Peace Chapel is dedicated to the Glory of God and in memory of Ernest N. Merrington MA, PhD., Minister of the Church 1910-1923, and Senior Chaplain A.I.F. 1914-1919. The Chapel contains most of the war memorial and commemorative elements housed within the church. The Chapel was named and dedicated in September 1996, as a designated memorial space. Ernest Merrington, Presbyterian Minister, offered his services the day war was declared against Germany on 4 August, 1914. He gained permission to hold the first church service in Shrapnel Valley at Anzac Cove. Soon, he was holding four services each Sunday, each one attended by hundreds of men. Often, soldiers would confess, they were not believers prior to the war. He used a small cup and plate to give communion. When he wasn’t preaching, Merrington was offering comfort to the wounded at the beach hospital or casualty clearing station. He visited hospital ships and moved between trenches visiting the troops. His communion set was donated to the church. ERNEST N. MERRINGTON M.A., PH.D.